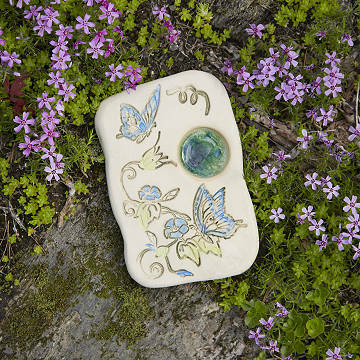 Create an enchanted garden by attracting butterflies with this stoneware and recycled glass puddler. A garden is a glorious place, from green shoots and blossoms that burst from the ground to the carnival of creatures that live in their shade. Give your garden the final touch of magic by inviting shimmering butterflies with this stoneware puddler. Simply place some sand or rock salt along with a teaspoon of water into the puddler's well of recycled glass. When the water evaporates (in under a day), butterflies are attracted to the minerals left behind from the water and sand/salt. Once butterflies know where they can find these minerals, they return regularly. Place it in a conspicuous nook to transform your outdoor space into an enchanted garden. Designed by Jo-Anne & Gerald Warren. Handmade of stoneware and recycled glass in Canada. Before I purchased the puddler, I enlarged the example photo so I could clearly see the paint colors, and they appeared to be dark pastels, with all the paint inside the outline of the butterflies. The puddler I received had gawdy bright blue and bright yellow paint that appeared to be stamped onto the puddler, and much of the paint was outside the outlines. Since this was a birthday gift that I needed right away, I gave it to my mom, but if I'd had more time, I would have returned the puddler and gotten my money back. This is not the quality I've previously received from Uncommon Goods. I am very disappointed. I will add this beautiful stone to my butterfly garden this spring. I had never heard of a butterfly puddler and will be excited to see the butterflies it attracts. This is a high quality piece of art. This is just a lovely gift. And who doesn't love butterflies? Was searching for a gift for the quintessential "person that has everything". They like to look at the garden, but don't want the work involved anymore and don't really have any other interests. This was the perfect piece - low maintenance for them and very beautiful. I am definitely going to purchase some of the other puddlers that are on the website! My niece Loves it. She sent me a picture and it looks exactly as on the web. I plan to get one for myself. Lovely gift for a garden. Butterflies enjoy it! Good quality material and craftsmanship. Will purchase again for my own garden! I actually bought this item twice and was very happy. Placed in the flower garden. Very nice addition.